Your Drive Just Got a Whole Lot Easier! Create a personalized "My Places" dashboard to save the places you go to most. Get instant travel times, traffic information and roadway status for your daily commute. We understand that by having a little more time means your day just got a little bit better! It’s your time...we just help you keep it. Imagine having the best information about the roads you drive the most. 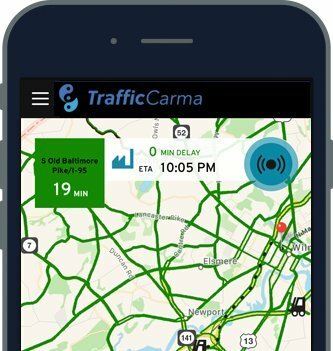 The TrafficCarma app provides you with the instant and accurate detail that you need. Through the TrafficCarma Operations Center, we process over one billion GPS data points a day tracking traffic flow and incident information that matter most to you. Dude, that's crazy! Our data is paired with created tips from drivers just like you! Tips from your fellow TrafficCarma users are relayed in real-time through the app. The credibility of our information is further enhanced through partnerships with the local TV and Radio stations in your hometown that you trust most. Pick and set up the places you drive to the most. Customize your dashboard by easily adding new ‘Places’. Use the ‘Just Drive’ feature to simply jump to your location on the map for a full view of the major roadways in your area. See your ETA, current travel time and commute status at a glance. Easily hear on-demand audio traffic reports. Use ‘Save Last Route’ to capture your favorite “short cut”. Submit tips on incidents, pot-holes and even record your own audio and video reports using the ‘Add Incident’ button. Compare your route options to the ‘Places’ you commute to most. Get one-touch access to the major roadways in your area. Customize your major roadways to focus only on the segments you drive. Become part of our Traffic CarMunity! Just by using the app and sharing tips to help fellow drivers you’ll earn Carma Points! … That’s Good Carma! Audio Alerts as you drive with incident information relevant to your drive. The experience is about YOU and making your daily commute easier!